The domain within your query sequence starts at position 3 and ends at position 190; the E-value for the KIND domain shown below is 2.3e-80. 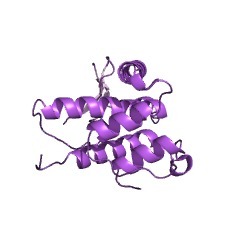 The KIND (kinase non-catalytic C-lobe domain) is a putative protein interaction domain, which has been identified as being similar to the C-terminal protein kinase catalytic fold (C lobe). The presence of the KIND domain at the N terminus of signalling proteins and the absence of the active site residues in the catalytic and activation loops suggest that it folds independently and is likely to be non-catalytic. The occurrence of the domain only in metazoa implies that it has evolved from the catalytic protein kinase domain into an interaction domain possibly by keeping the substrate-binding features [(PUBMED:12877999), (PUBMED:16099729)]. 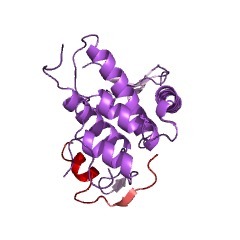 In SPIRE1 (protein spire homologue 1) this domain interacts with FMN2 (formin-2) [(PUBMED:21730168), (PUBMED:21705804)]. There are 2650 KIND domains in 2324 proteins in SMART's nrdb database. Taxonomic distribution of proteins containing KIND domain. This tree includes only several representative species. The complete taxonomic breakdown of all proteins with KIND domain is also avaliable. Click on the protein counts, or double click on taxonomic names to display all proteins containing KIND domain in the selected taxonomic class. The KIND module: a putative signalling domain evolved from the C lobe of the protein kinase fold. 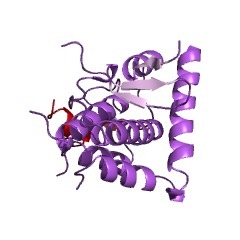 A novel putative interaction domain - KIND (kinase non-catalytic C-lobe domain) - has been identified as being similar to the C-terminal protein kinase catalytic fold (C lobe). 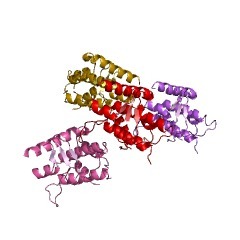 Its presence at the N terminus of signalling proteins and the absence of the active-site residues in the catalytic and activation loops suggest that it folds independently and is likely to be non-catalytic. The occurrence of the novel domain only in metazoa implies that it has evolved from the catalytic protein kinase domain into an interaction domain possibly by keeping the substrate-binding features. This information is based on mapping of SMART genomic protein database to KEGG orthologous groups. Percentage points are related to the number of proteins with KIND domain which could be assigned to a KEGG orthologous group, and not all proteins containing KIND domain. Please note that proteins can be included in multiple pathways, ie. the numbers above will not always add up to 100%.